"36 years old," I told my family at dinner tonight, shaking my head. "I'm on the downhill slope to 40." My dad just laughed. "Hey," he replied, "we're in our 60's. We're on the downhill slope to death..."
It was a fabulous birthday today. Lunch at Lucille's BBQ, dinner at King's Fish House, cupcakes from my favorite bakery, kid-free shopping time at Macy's, a rousing game of musical chairs with my daughters, a present scavenger hunt that was written up by my darling husband, who even took time to gift wrap my ironing board -- since I don't have a locker anymore, he said. I'm feeling pretty spoiled tonight. Truly I have The Best Family In The Entire World. For that matter, I have the best readers in the entire world, which is why I love holding a giveaway on my birthday each year. It's my little way of saying thanks to all of you wonderful people who constantly make my day with your encouraging comments. 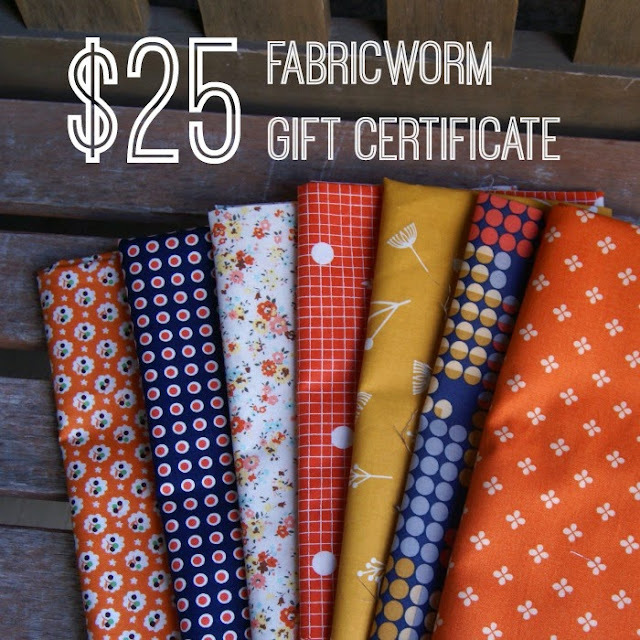 This year my dear friends at Fabricworm have volunteered to help me out by supplying the incredibly awesome prize: 2 yards of your choice from the new Charley Harper collection. Your choice...as in any print from that line -- poplin, canvas, flannel, or knits. The giveaway will only be open until 5pm on January 1st, so get your entries in ASAP. Leave a comment on this post -- any comment -- for one entry. Followers old and new can leave a second comment for a second entry. International entries are welcome, and please be sure to include your email address in your comment if you're a no-reply blogger. I'll pick a random winner and announce it on Wednesday night. The winner needs to contact me within 48 hours or I'll have to choose another name. Spread the word -- this prize is too good to miss! You guys have made my 2013 a wonderful one, and I thank you with all my heart. Many of you know that we make an annual summer trip to Arizona to spend time with my husband's family. This year we're going to try making an extra visit over Christmas break, and as I started working on travel details over the weekend, the image of a travel case popped into my mind and insisted that I give it some attention. It's been a while since I've dropped everything to work on a new sewing idea, but I'm so glad I did. These little bags are my new best friends. My first attempt was the smaller of the two cases you see above. It was surprisingly quick and fairly easy to sew. The only drawback is a smaller opening since the zipper just runs along the top of the bag. Once this first one was done, I began right away on a larger version with an extended zipper down the sides. It's a tricky process, but I was able to make it work, and I absolutely love the results. The bags are lined with text prints, which are always a favorite of mine. Both have linen exteriors featuring prints by Heather Ross and Melody Miller and two different shades of yarn dyed Essex linen. I used a heavy wool/acrylic blend Aurifil thread for the stitching on both bags. It's not only strong, but I like the way the larger stitches look against the linen. It all comes together to create a vintage style look that I absolutely love. Happy Friday, everyone! 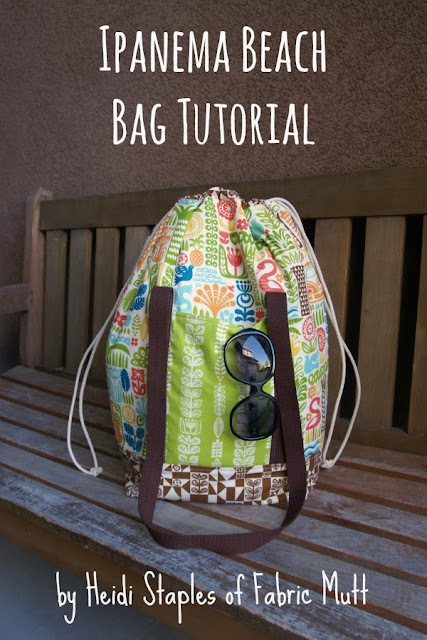 You'll find me guest posting over at the Birch Fabrics blog today about my beach bag tutorial using their fabulous new Ipanema collection. Christmas may be only five days away, but it's never too early to start planning for summer, I say! Linking up to Finish It Up Friday. I made a little zipper pouch for a dear friend of mine last week who was having a birthday, and forgot to share it with all of you. 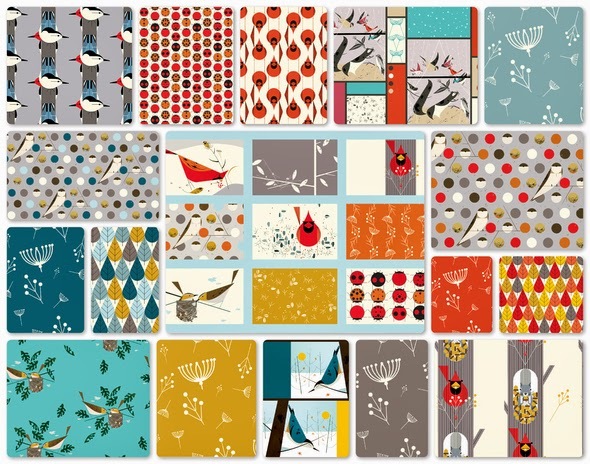 These Charley Harper prints by Birch are so amazing. I love the colors and designs. I did just two lines of quilting on both sides of the pouch, tracing the lines of this cheater print. The lining is Country Twang in Pearl Snap from Eric and Julie Comstock's new Honky Tonk collection for Moda. I'm telling you, those Comstocks always include at least one "must stash" print in every one of their lines. I adore this design! It was great fun looking through all of your favorite sewing book titles during this past giveaway week. Your answers ranged from vintage to modern, and I saw lots of titles from my own personal library tucked in among them. 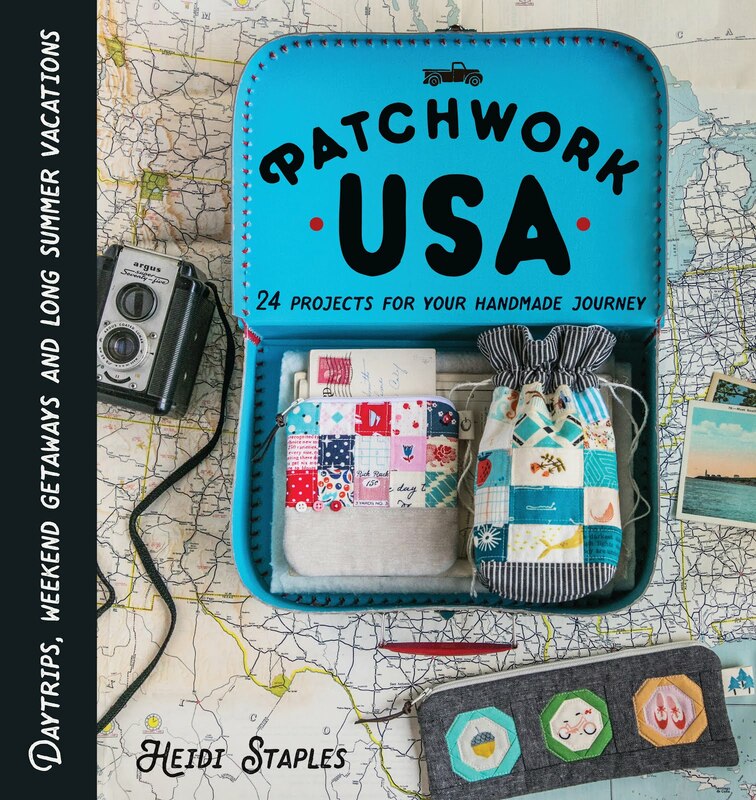 A very unofficial tally of the results seems to show that the two most popular books are Sunday Morning Quilts by Amanda Jean Nyberg and Cheryl Arkison and Free Motion Quilting by Angela Walters. Both are highly recommended! I wish I could send a gift certificate to all of your inboxes, but since I can only afford one, we'll go with Fiesta. I've sent you an email and hope to hear back from you soon! Eight years of marriage to this guy. Best decision I ever made. Happy Anniversary, sweetheart. 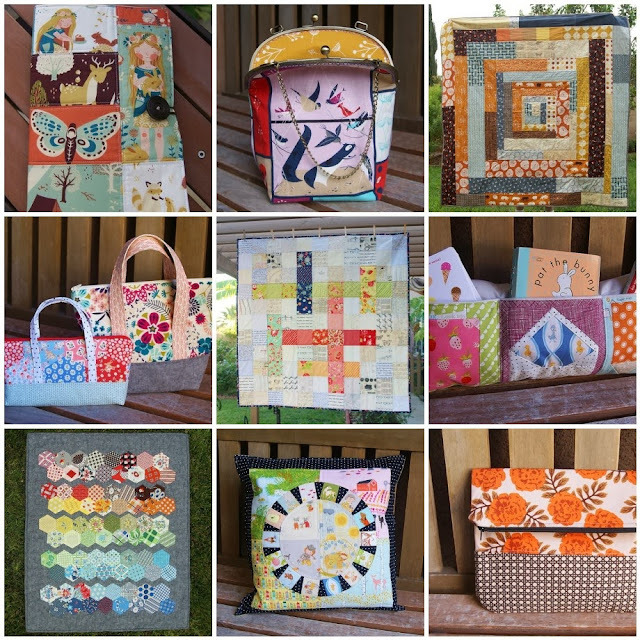 It's here again -- Sew Mama Sew's biannual Giveaway Day! I love this opportunity to get to know a few new faces in the online sewing community while getting my name in the ring for some fantastic prizes. If you're a newcomer to Fabric Mutt, welcome to my little corner of the blogging universe. Above is a mosaic of my projects pulled from the past six months -- so many great memories here. If you stop by my blog often, this is the kind of stuff you'll see. I'm currently working on a book for Stash Books, so there's a lot going on behind the scenes these days, but I'll have lots more to share with you in the coming year. 2013 has been amazing, and I know that 2014 is going to be just as great! I know you have hundreds of other sites to visit before the day is through, so let's get to the giveaway. Normally I love to pull some fabric from my stash to share with one of you, but between rising shipping costs and packages going missing, I'm taking no chances. This week's winner gets a $25 online gift certificate to one of my favorite fabric shops: Fabricworm. International entries are welcome, and the winner will be chosen randomly and announced here this Friday (12/13) after 5pm. Please be sure that you leave an email address in your comment if you're a no-reply blogger so that I can get in touch with you if you've won! All you have to do is leave a comment on this post answering this question: what's your favorite sewing book? I usually love to answer my readers' comments on the blog, but due to the high volume of remarks left on giveaway posts I probably won't have the chance to answer everyone this time. Come back again with a comment on another post, though, and I'll be happy to chat with you! Thanks so much for stopping by and have a wonderful week! Linking up to Giveaway Headquarters at Sew Mama Sew. I was touched beyond words by your sweet comments and emails on my last blog post. I know that our family is not the only one dealing with the emotionally and physically draining process of caring for elderly loved ones. It's another one of those personal details that we deal with offline that has a huge impact on daily life even if it doesn't normally get a mention on our blogs. Bless you all for your kind thoughts and prayers for my family, and blessings on those of you who are walking this difficult road alongside us. There are days when it seems that we're not going to be able to take another step, and then somehow we find a way to go on. It was a very long, tiring day, but we were able to get my grandmother safely moved into a beautiful nursing facility that's only ten minutes away from our home.Though she had been dead set against leaving her house, she came willingly with us when it was finally time to go. Upon our arrival, the caregivers immediately lavished Grandma with love and attention, and it was a joy to see her blooming in response. She loved the quilts on the walls, the new quilt and matching pillow that I had made for her bed, and her new "plush" apartment, as she kept calling it. We were even able to all come back for a visit in the evening with my girls who hadn't seen their great grandma in months. It was such a relief to leave knowing that she was safe and surrounded by people who would take good care of her until we returned for our next visit. "It's a good thing you did," she told my mother before we left last night. It was back at the end of August that my grandmother found a magazine article all about patchwork quilts made out of vintage feedsack material. "Can you make one for me?" she asked over the phone as I flipped through the pages that she had sent to me so that I could see the photos. I assured her that I could make something similar out of reproduction prints, and a bundle of Storybook Classics by Windham Fabrics was quickly ordered. I had already started cutting out pieces to make a Swell quilt from Simply Retro by Camille Roskelley when I got the news that my book proposal had been accepted by Stash Books. "Never mind, darlin', there's no hurry," Grandma assured me when I fretted over getting her quilt done along with my book projects. "Just make it in time for Christmas," she added. I was able to sew together one block, and then the rest was set aside as I turned my mind and hands to other things. Little did I know then what lay ahead. Over the past few months we have watched my grandmother spiral down into an unexpected and very serious state of dementia. After a painful and exhausting November, it's become clear that Grandma can no longer safely live alone in her home, so tomorrow we'll be moving her into a nursing home just ten minutes away from us where she can receive full time care. 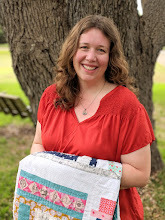 I wanted her to have something special for her new home, so this weekend I pulled out that bundle of Storybook Classics again and put together the simplest of patchwork quilts. Twelve inch blocks are bordered by a narrow strip of white and bound in a black and white dot print. I backed it in two different prints by Bonnie & Camille from their Vintage Modern and Marmalade collections. It may not be fancy, but the quilt is almost exactly what Grandma had originally wanted, and it will fit perfectly on her new bed. 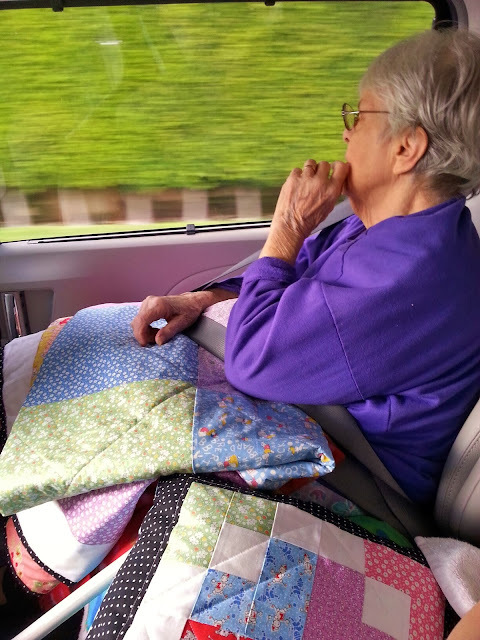 Tomorrow when we pick her up from the house she's lived in since she was a girl, I'll have the quilt waiting in the car so that she'll have something to look at during the drive to her new home. I spent yesterday evening helping my parents fix up Grandma's new room, trimming a little Christmas tree with vintage style ornaments and decorating the walls with some of the quilts I've made for her over the past few years. As I drove home afterward listening to Christmas carols on the radio, I was suddenly overcome by tears. Even though we know that everyone grows up and gets older, you can never really prepare yourself for the reality of what that means. And even though we all talk about time getting away from us, I am stunned by how quickly life is going by each day...each year. It seems like just yesterday my parents were making Christmas for me and my sister, and now we're making it for our own daughters. In fact as I type this sentence, my girls are eagerly pulling at my sleeve and saying, "Is it time to decorate for Christmas, Mommy? We've been waiting soooo long!" Precious little girls -- they have no idea how quickly time can fly. This December I plan to make the most of every moment...every single one. Won't you join me?